A friend of some of my clients put up an invisible book shelf. How’d he do it? A book (or two or three) that you don’t want or need anymore. An L-bracket (or two or three) with screws that fit it. A screw driver. Some extra screws. Maybe some anchor screws. A pen. A straight edge. Choose a suitable book that you won’t want to read ever again. This will become the “sacrificial” book that makes the shelf. 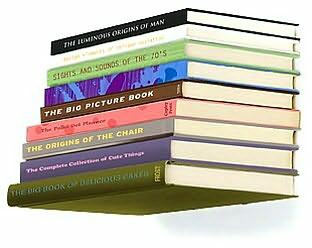 Since it will be supporting other books, a large, hardcover book works best. Trace an L-bracket onto the inside of the book. Open the sacrificial book’s back cover and use your tape measure to find the halfway point. Make a mark at the halfway point on the page. Place a flat side of the L-bracket onto the page and trace the outline, using the marks you drew to keep it centered. If the bracket’s screw holes are also centered, line them up with the marks to make this easier. Cut notches for the L-bracket into the book. Use your utility knife to cut into the pages of the book following the outline of the bracket. Make sure to cut deeply enough so the back cover of the book can be closed tight against the pages when the bracket is inserted. Place the L-bracket into the notch, making sure that the vertical bar of the “L” is pointing in the direction of the front cover of the book. This will enable you to flip the whole thing over and hang it right-side-up when it’s ready. Make a notch in the top edge of the book for the L-bracket. This way the book can sit flush against the wall. Screw the book to the bracket. Get your drill out and drill through the holes in the L-bracket. Screw the L-bracket to the book. The pages will rise up the screw as you insert it, so use your hand to hold the pages down. Secure the pages so that the book sits perfectly flat. Drill two holes near the outside corners of the book, one on each side. Secure the pages by inserting screws into the holes. Cover the inside back cover of the book in glue and close it. Place a stack of books or some other type of weight on top and let it dry at least 8 to 12 hours. Unless you want the back cover of the book to flap open after you hang the shelf, cheating at this stage is not advisable. Find a wall stud. This is a vertical beam in the wall into which you can screw the L-bracket. To find it, knock along the wall until you find a place that doesn’t sound hollow. Another way to find a stud is to use a stud finder. 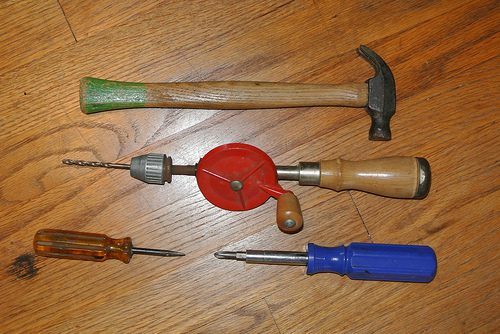 If drilling into a stud isn’t ideal or won’t work in your house, use anchor screws instead. These are suitable for both drywall and plaster walls. Make note of how much weight the anchor screws are rated to hold so that you don’t overload the shelf. Mount the bracket to the wall using the large wood screws. To keep the shelf level, screw the bracket with a single screw at first, place a level across the book, make any necessary adjustments, and secure the shelf with a second screw. Stack books on the shelf. To hide the L-bracket, stack them up high, preferably from largest to smallest. Now let your friends try to figure it out. Fake out your friends and feel proud of yourself.